Many of our past students go on to achieve wonderful things and Mackay entertainers Oz Cabaret are no exception. 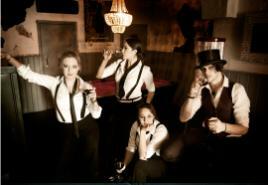 The former Central Queensland Conservatorium of Music graduates have developed a unique cabaret act that brings together their love of performing and wine. So as well as getting to experience a stage show, their audience also get to participate in a wine tasting. How can you go wrong? This clever blend has really gotten the group noticed and following successful performances around Australia they have been invited to perform at fringe festivals around Europe including Edinburgh and Amsterdam. Even though I haven’t had the opportunity to see Oz Cabaret perform yet, I am looking forward to getting the chance to do so. Congratulations on this remarkable achievement. I am sure the tour will be a smashing success! If you want to know a bit more about Oz Cabaret and help them on their quest to perform at the World’s biggest performing arts festivals click here.